Born at Carngham, Charles married Mary Ann Sergeant (1856-1930) there in 1878. The marriage certificate sighted by Cynthia Tizzard tells us the wedding took place after banns in the Holy Trinity Church at Carngham. Charles was a bachelor farmer and Mary Ann a spinster. The officiating clergyman was Edward K. Yeatman, and written consent was given by Charles' father, John Wright. The wedding was witnessed by John Wright and Euphemia Williamson (?). The fathers of both parties were said to be farmers. Mary Ann was born at Lexton some 10 km north of Beaufort. The 'Alexanders descendants' family tree on Ancestry has her parents as Thomas Sargeant (1803-78) and Jane Stewart (c1815-1900) who were married at Paisley in Renfrewshire in Scotland (Jane's place of birth) in 1836. Thomas and Jane had six children, four born in Scotland and two in Victoria. The Australian electoral rolls show that Charles, who worked as a labourer and blacksmith, and Mary Ann lived initially at Beaufort before moving to Melbourne sometime before 1914. They lived the remainder of their married lives in the inner Melbourne suburb of Footscray, Mary Ann dying there in 1930 and Charles five years later. The following death notice for Charles was published in the Melbourne Age on 25 July 1935: 'WRIGHT On the 24th July, at the residence of his son-in-law, Mr T. Thomas 'Kia-Ora', 4 Pentland Parade Seddon, Mr Charles Bodger Wright, the dearly beloved husband of the late Mary Ann, and loving father of Ethel (Mrs T. Thomas), Charlie, Jack, George (dec), Tom, Alf and Gertie (Mrs H. Nelson), aged 76 years. Mother and Father reunited'. Charles Bodger and Mary Ann Wright had eight children, one of whom, Bertha Laura Wright, died as a child at Carngham in 1887. The remainder went with their parents to Melbourne and eventually produced 20 grandchildren and 36 great grandchildren we know of. 1.1) Gladys Lilian Thomas (1903-83). Born at Beaufort, Gladys married a Scot, Donald Wilson Robertson (1911-76), son of William Robertson and Janet Seth Wyllie, in Melbourne in 1938. Gladys, who seems to have worked for a time as a teacher, and Donald, a manager, lived all their married lives in Melbourne. Donald died at Brunswick in 1976 and Gladys at Preston in 1983. Both are interred at the Fawkner Cemetery. Although still to be confirmed we think they had at least three children: Janet, Jeanette Wilson and Alan Wilson Robertson. 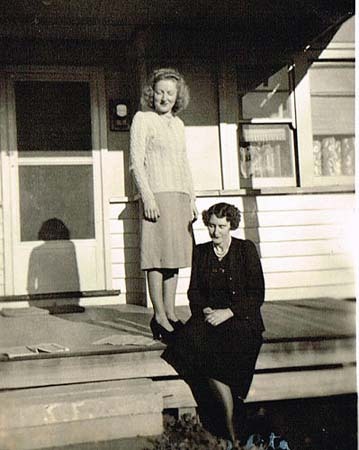 1.2) Bertha Laura Thomas (1908-90). Also born at Beaufort, Bertha married an engineer, John Kranz, in Melbourne in 1932. They lived in the Melbourne suburb of Maribrynong for most of their married lives, John dying there in 1972 and Bertha in 1990. Both are interred in the Fawkner Cemetery. We don't know if they had any children. A wedding that has raised considerable interest amongst a large circle of friends in Beaufort and district was celebrated at the ? Beaufort on Wednesday 22 September. The parties to the wedding were Mr C.B. Wright, second son of C.B. Wright senior of Beaufort and Miss R. H. P. Mitchell first daughter of Mr Stewart Mitchell also of Beaufort. The marriage ceremony was performed by the Rev Charles Neville . . . The bridesmaids were Miss Elsie S. Mitchell . . . the groomsman was Mr T. Wright . . . A large number were at the station to see the young couple away on the train. Their future home is in Melbourne. The Australian electoral rolls show that Charles and Rosalie lived all their married lives at Footscray in Melbourne, both dying there in 1959. We don't know if they had any children. 3.1) John Sargeant Wright (1906-91) was born at Beaufort and married Isobel Dowrie (1911-2006) there in 1935. The Australian electoral rolls show that John worked as a plasterer and driver and that he and Isobel lived most of their married lives at Portland in south western Victoria. John died at Portland in 1991 and Isobel in 2006. We think they had a daughter, Robyn Joy Wright, who was working at Portland as a clerk at the time of the 1968 election, but don't know if they had any other children. 3.2) Born at Beaufort, Elizabeth Mary Wright (1908-33) married a Creswick-born labourer, William Perman Tainsh (1894-1975), son of William Tainsh and Mary Matilda Bernaldo, in 1930. She died at Ballarat three years later. Kylie Wright's family tree on MyHeritage says that Elizabeth and William had one child. 3.3) Wilbur Robert Wright (1910-85), who worked as a plumber, married Ballarat-born Gwendoline Josephine Harpley (1914-2011) in 1936. The 'Daykin Family Tree' on Ancestry tells us that Gwendoline was the youngest daughter of Joseph Harpley (1866-1944) and Elizabeth Williams (1870-1971) who were married at Ballarat in 1888 and had ten children. Joseph came from Sprowston in Norfolk and Elizabeth was Castlemaine born. Wilbur and Gwendoline lived in Melbourne all their married lives, he dying at Glen Iris in 1985 and she in 2011. We believe they had two children: Barry Douglas Wright, who was working as a designer at the time of the 1958 election, and Janice Elizabeth Wright, who was working as a teacher in 1963. 3.4) Maxwell Charles Wright (1912-79) married Lucy May ('Maisie') Saw (1916-2002) in 1934. According to the 'Saw Family Tree' on Ancestry, Lucy's parents were Harry Frank Alfred Saw (1895-1969) and Violet May McDonald (1897-1941) both from Ballarat. It adds that Lucy and Maxwell had four children all still living. The Department of Veterans' Affairs World War II nominal roll shows that Maxwell was born at Ballarat on 30 May 1912 and enlisted in the Royal Australian Air Force at Melbourne on 7 July 1941. He was then living at Ballarat and gave as his NOK his wife Lucy. He was discharged on 20 November 1945 as a Leading Aircraftman in 37 Squadron. They lived all their married lives in Ballarat, Maxwell dying there in 1979 and Lucy in 2002. 3.5) Duncan Charles Wright (1914-2003) married Ballarat-born Mavis Catherine Kilfoyle (1914-2011) in 1937. The Australian electoral rolls show that Duncan worked as a carpenter and he and Mavis lived in and around Ballarat all their married lives. Although still to be confirmed, we believe two of their children were Faye Lynette Wright, who was working in sales in 1963 and Graeme Geoffrey Wright, a plumber. 3.6) Victor Bennie Wright (1917-2013) lived at Wendourie near Ballarat and worked as a mill hand before the war. The Department of Veterans' Affairs nominal roll for World War II shows that Victor enlisted in the Royal Australian Air Force at Melbourne on 5 August 1941. He was then living at Ballarat and gave as his NOK his father John Wright. He was discharged on 23 January 1946 as a Leading Aircratman in 31 Squadron (an airbase support squadron formed at Wagga Wagga in 1942 and disbanded in 1946). Sometime after this he married Jean Isobel Hughes. The 'Bob Petty Family Tree' on Ancestry tells us Jean was born at Ballarat on 27 April 1922, the eldest daughter of Thomas Robert Hughes (1895-1982) and Florence May Coffield (1890-1968) who were married in Ballarat in 1920 and had two children. The electoral rolls show that Victor, who was working as a welder, and Jean lived at East Ballarat after their marriage and had at least one child, Raymond Victor Wright who was a student at the time of the 1972, 1977 and 1980 elections. Victor and Jean both died at Ballarat he in 2013 and she in 2001. His great granddaughter, Leanne Wegrzyn, tells us George married Janet Lumsden McKerral (1889-1978) at Carngham on 16 October 1907 and the couple had four children before George's untimely death in Melbourne in March 1919. 'George died from the Spanish flu as did his young son approximately one month later. My grandfather told me that the family visited George at the Footscray Technical College which had been turned into a hospital. I don't know how long George was there but eventually he was well enough to come home. My grandfather recalls that he immediately went back to building a house (this was how he made a living) and he recalls watching him on the roof of the house. Within 24 hours George was back in hospital and died soon after. Needless to say his wife Janet was stricken with grief. Her mother had died in late April 1919 (not flu related) and her son Andy would die in June'. Leanne adds that George and his young son are buried together in the Footscray cemetery and adjacent to the grave of George's parents ('the headstones are literally head to head'). According to the Andrews Family Tree on Ancestry, Janet was born at Carngham in Victoria on 5 October 1889, the eldest daughter of Dugald McKerral (1862-1933) and Elizabeth Watt Ringin (1860-1919) who were married in 1887 and had four other children (Andew, Joan, Agnes and Margaret). After George's death in 1919, Janet re-married, to Walter Hayward (1894-1974) in 1926, and had one son with him: Douglas Hayward (1927-78). The Australian electoral rolls show she and Walter farmed land at Cheviot near Yea in central Victoria until the early 1960s when they moved into Yea. She died in 1978 in the Melbourne suburb of Frankston, where her daughter, Dorothy, was then living. As noted above, George and Janet had four children one of whom, Andrew George Wright (1914-9), died at a young age. Their other three children all married and provided their parents with three grandchildren and five great grandchildren we are aware of. 4.1) Robert Dugald Wright (1909-98). Born at Beaufort in 1909, Robert, or 'Bob' as he was known as, married Marjorie Clara Harris (1910-2003) in 1930. The electoral rolls show they lived at Cheviot with Bob's mother and step-father before moving to Melbourne where they lived at Bentleigh and later Oakleigh. Leanne tells us they had one child, a daughter Janet 'who died many years ago'. She adds that 'a few years back' she 'stumbled on some photos on the State Library of Victoria website that were donated to them after Bob's wife Marj died. It's known as the Harris & Wright families collection. They are a mixture of both families' photos but there are certainly some of Bob and Alex. I haven't had a chance to detail for the library the ones I know for sure . . . however . 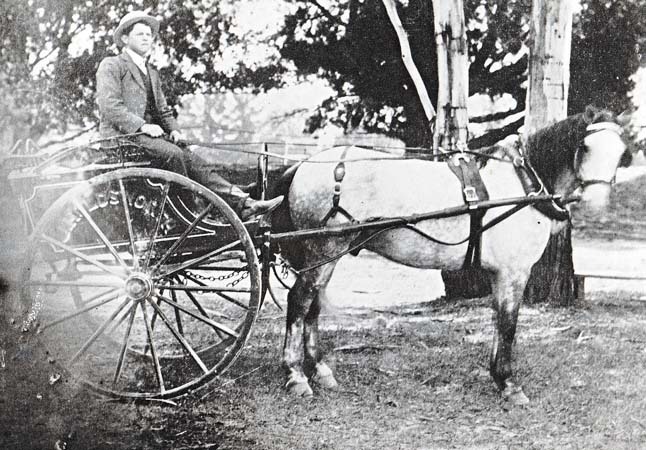 . . number 50 [shown below] - a man seated in a horse drawn buggy - is of my grandfather about to depart to NSW to go shearing during the Great Depression. All the farming photos are from Limestone and contain members of my family. Bob and Alex are in a lot of them. 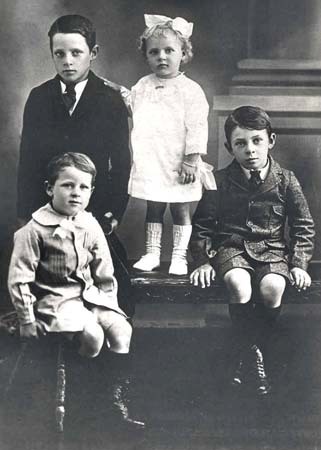 You'll also see that there is a photo [also shown below] of the four young Wright children'. 4.2) Alexander Charles Wright (1911-2004). Remembered by his granddaughter, Leanne, as 'a wonderful regaler of family history', Alexander ('Alex') was born at Beaufort in 1911. He married Yea-born Rita Eveline May Simmons (1912-89), daughter of Henry Ernest Simmons (1884-1961) and Sarah May Gale (1892-1977). Alex, who was a farmer, and Rita lived at Cheviot and then Yea where they both died, she in 1989 and he in 2004. They are buried together in the local cemetery where their gravestone shows they had a daughter, Lesley, and three grandchildren: Leanne, Sharon and Alan Wright. Leanne tells us her grandfather 'spoke often of his father's brothers who after George died spent their weekends building my great grandmother a home in McKinnon (in Melbourne and near to her family) for her and the children. My grandfather used to tell me that every Sunday they would catch the train to the Footscray Cemetery to visit George and Andy's grave. Eventually Janet remarried and moved to Limestone which is a district just outside of Yea, Alex and Athol went with her but Bob was old enough to stay in Melbourne and work. Over the years Alex gradually lost touch with the Wrights but thought his brother Bob had more to do with them as a result of him remaining in Melbourne'. and her sister Jean Olive Elizabeth Simmons (1924-69). Alexander Charles ('Alex') Wright about to depart from Cheviot for New South Wales during the great depression. Born at Beaufort, Thomas married Margaret Heather Boyd (1890-1953), daughter of George Boyd (1853-1925) and Sarah Lucy Caroline Hatfield (1856-1905), at Chute in central Victoria in 1912. As the following death notice, published in the Melbourne Age on 25 June 1953 indicates, Margaret died at Belgrave in in the Dandenong Ranges of Victoria: 'WRIGHT - On June 24. at her home. Benson Street. Belgrave. Margaret Heather, dearly loved wife of Thomas, loved mother of Joyce and Nancy. Ever remembered'. She was cremated at the Springvale Crematorium on 26 June 1953 and her ashes placed in the Melaleuca Garden. Thomas, who worked as a blacksmith, died at Footscray in 1967. They had two children we know of: 1) Joyce Bate (1916-2004) who married William Henry Bate (1920-93) in Melbourne in 1947 and had two children; and 2) Nancy Bate who was born at Footscray in 1917. 6.1) Margaret Mary Wright (1921-2004) was born in the Melbourne suburb of Brunswick and married John Alexander ('Jack') Magill (1919-2005) sometime between the end of the Second World War and 1949 (the election roll for that year shows Margaret and John Alexander Magill, who was working as a hairdresser, living in the Melbourne suburb of Greensborough). The Department of Veterans' Affairs Second World War nominal roll shows that John Alexander Magill, born at Brunswick in Melbourne on 13 November 1919, enlisted in the Australian Army at Caulfield on 26 June 1942. His place of residence was the Melbourne suburb of Hawthorn and his NOK was Arthur Magill (Ancestry's index of Australian bdms shows that an Arthur Magill and Eunice Nellie Kennedy were married in Victoria in 1920). Jack was discharged from the Army on 13 October 1945. He was then a private soldier in the 2/8th Infantry Battalion. The 2/8th Battalion was formed in Melbourne in 1939 and later relocated to Puckapunyal in central Victoria. Together with other units of the 19th Brigade of the 6th Australian Infantry Division it saw action in Palestine, northern Africa and Greece before returning to Australia in March 1942. Jack would have joined the battalion later that year, serving in the Darwin garrison force and then in north Queensland before landing at Aitape in New Guinea in November 1944. Here the battalion was involved in the Danmap River operations, the advance on Wewak and the clearance of enemy forces from the Prince Alexander Range. Following the Japanese surrender on 15 August 1945, members of the 2/8th began returning to Australia for discharge. The last of the battalion departed Wewak on 10 November, and was disbanded at Puckapunyal on 14 December 1945. The Australian electoral rolls show that after their marriage Jack and Margaret lived at Greensborough and later Watsonia in Melbourne (where their son Terence John Wright was serving in Australia's Vietnam-era Army). In the 1970s they moved from Melbourne to live at Ventor near Cowes on Victoria's Philip Island. As the following death notice published in the Melbourne Herald Sun on 20 December 2004 indicates, Margaret died at Philip Island: 'MAGILL. - Margaret Mary, passed away on Dec. 18, 2004 at Warley Nursing Home, Cowes. Beloved wife of Jack. Loving mother of Terry, Maureen and Therese. Mother-in-law of Pam and David. Loved and loving Nana of Caroline, Kim, Shaun, Nathan and Hannah. At Peace'. Jack died at the same location on 3 August 2005. GINNIVAN. - Francis John (Frank), passed away peacefully on July 12, 2004 at Warley Hospital Cowes. Dearly loved husband of Jean. Loved father of Geoff and Glenda, John and Lorraine, Maree and Ray, Steve and Suzi, Paul and Tracey, Mark and Jenny, Geraldine and Noel, Andrea and Angie. Loved Pa of Rebecca and Sean and Luke (dec); Catherine (dec), Matt and Kirsty, Kathy and Paul, Leanne and Adam; Kate and Nathan, Amy and Gav and Josh; Kieran, Ruby, Alana and Lilly; Patrick, Jessica, Caitlin and Michael; Madeline, Yvette and Adele; Tanya, Melissa and Dean. Loved Great Grandpa of Eden, Shanae, Olivia, Stephanie, Jessie and Chloe. GINNIVAN. - Jean Rose. Passed away peacefully on Dec. 9, 2011, at Wonthaggi Hospital Dearly loved wife of Frank (dec). Loved mother of Geoff and Glenda, John and Lorraine, Maree and Ray, Steve and Suzi, Paul and Tracey, Mark and Jenny, Geraldine and Noel and Andrea. Loved Nana of Rebecca and Sean and Luke (dec), Catherine (dec), Matt and Kirsty, Kathy and Paul, Leanne and Adam, Kate, Amy and Justin, Josh and Bec, Kieran, Ruby and Jarvis, Alana, Lilly and Mat, Patrick, Jessica and Frank, Caitlin and Michael, Madeline, Yvette and Adele, Tanya and Rod, Melissa and Chris and Dean. Loved Great Nana of Eden, Shanae, Olivia, Stephanie, Jessie and Chloe, Amelia, Jasmine, Maya, Riley and Kai. WRIGHT. - George Alfred. Suddenly on Aug. 2, 2006 Devoted husband of Pauline. Father of Anthony, Christopher and Peter. Son-in-law of Marg (dec), Bill and Dot. Adored Grandfather of Christian, Indira, Matthew, Shai, Toby, Abbey and Charlie. My sweetheart since I was 16, the love of my life. I will be strong for your beautiful boys and families. - Love always Pauline. Dearest Dad and Grandpa, the love and wisdom you have shown us is invaluable. Your smile, your laughter will be with us forever. Will miss you mate. - Your loving son Anthony, daughter-in-law May, Christian and Indira. Our fantastic, funloving, joyful Grandpa. Never a dull moment. We love you and miss you. Forever in our hearts. - Love Shai, Matthew and Sandra. Dad, you were my inspiration, my hero, my second soul. Your spirit will be with me forever. I will miss you Dad. I love you - Chris. Dear Dad and Grandpa, you werealways my compass in life, gave me strength and direction, with ups and downs, but you always came up with positives as answers. Not only did you motivate me but give me the inspiration in everything to do with life. We will sadly and deeply miss you and cherish our time together as the best father, grandfather and mate. - Love always Peter, Helen, Toby, Abbey and Charlie. From the 'Cuckson Moger Kernot Jones' Family Tree on Ancestry, this photo shows Alfred and Delia Wright and their two daughters. 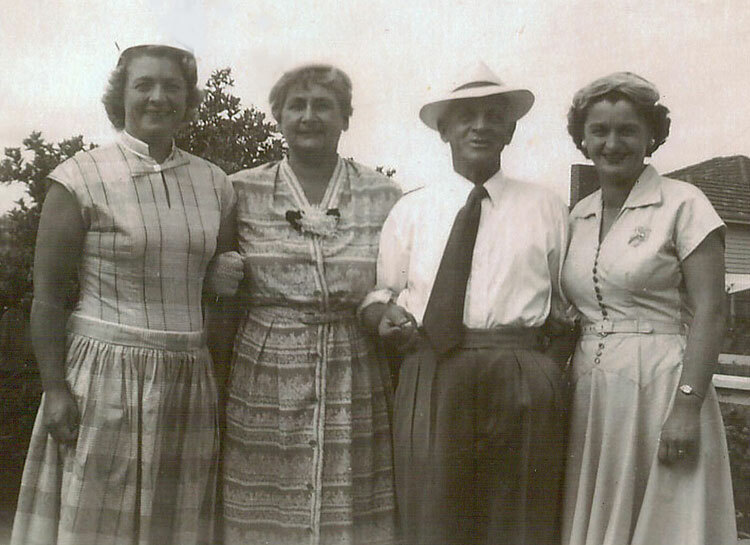 (L/R): Margaret Mary Magill nee Wright, Delia Ann Wright nee Cuckson, Alfred Henry ('Alf') Wright and Jean Rose Ginnivan nee Wright. Born at Beaufort, Gertie was living with her parents in Footscray at the time of the 1919 elections. Sometime between then and 1924 she married a returned serviceman, Howard Cornelius Nelson (1895-1987). Howard's attestation papers show he was born at Preston in Melbourne on 6 August 1895, was single and studying as a student draftsman when he enlisted at Melbourne on 23 January 1918. He was then living with his parents at 163 Charles Street in the Melbourne suburb of Seddon and gave as his NOK his father, Mark Nelson, of the same address. He seems to have previously served in the Australian Medical Corps in Australia. Howard was allocated to the No 1 Section Sea Transport Staff and embarked from Sydney on the THEMISTOCL arriving at Liverpool in England on 29 March 1918. He returned to Australia on the SS SERVIC on 7 June 1918 and re-embarked at Melbourne on HMAT A74 MARATHON as an acting Cpl on 23 July 1918. 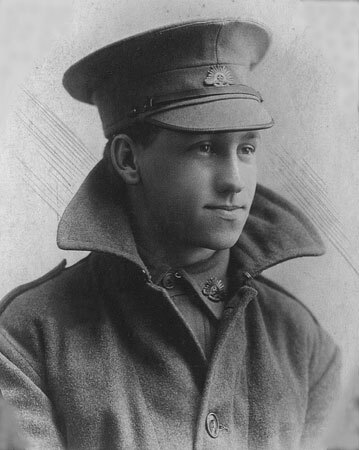 He returned to Australia on the same vessel and was eventually discharged from the Army as a private soldier on 26 January 1919. Ancestry's index of Australian bdms shows that a Mark Nelson and Janet Arnott were married and had at least five children: Alexander Mark (1891, Williamstown), Lydia Medora (1892, Williamstown), Emily Bertha (1894, Preston), Harold Frederick (1897, Northcote) and Maude Abeline Nelson (1897, Northcote). The 'Nelson Family Tree' on Ancestry tells us Mark was born Marius Neilson at Romo, Sonderjylland in Denmark on 6 January 1858. He married Janet Arnott at Williamstown in Melbourne on 4 March 1889 and had eight children. They included, in addition to those already mentioned, Howard Cornelius (1895, Preston) and Ethel Dorothy Nelson (1900, South Melbourne). The Australian electoral rolls show that after their marriage, Gertrude and Howard, who worked as a joiner, lived their married lives at Footscray, Broadmeadows and Glen Iris in Melbourne. Gertie died at Glen Iris in 1970 and Howard there in 1987. Both were interred in the Rose Garden in the Altona Cemetery. They had at least four children we are aware of, two of whom - Maxwell Howard and Janet Marcia Nelson - died at a young age. 7.1) Betty Irene ('Beth') Nelson (1926-51) died at Melbourne's Alfred Hospital in 1951, aged 25 years. The following notices were placed in the Melbourne Age on 12 June that year: 'NELSON - On June 11, at Alfred Hospital, Betty (Beth) Irene Nelson, of 196 Ballarat road, Maidstone, the dearly beloved daughter of Howard and Gertrude, much loved sister of Stanley, and loved niece of Dora, Maud, and Dorrie, aged 25 years. In God's care. NELSON - On June 11, at Alfred Hospital, Beth, loved friend of Fred. In God's loving care'. 7.2) Stanley Howard Nelson. The Australian electoral rolls show Stanley Howard, chemist, and Marjorie Alison Nelson living at 124 West Street in the Melbourne suburb of Glenroy in 1954; at 'Top Ridge' on Broadweadows Road in Broadmeadows in 1968; 289 Broadmeadows Road Tullarmarine in 1977 (along with a David Stanley Nelson, artist); and 15 Redstone Hill Road in Sunbury in 1980 (along with Staney's father Howard and David Stanley Nelson, graphic artist). 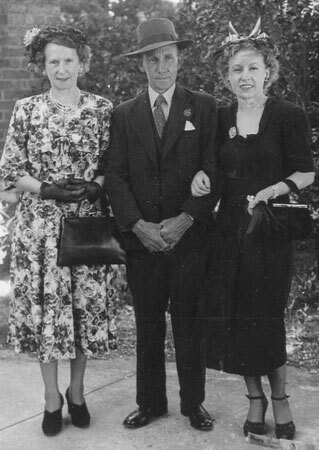 Howard Cornelius Nelson in 1918 and in 1949 with his sister Maude Abeline Nelson and daughter Betty Irene ('Beth') Nelson. The 'children of George Robert Wright' and 'Alex Wright about to head to NSW during the depression', courtesy of Leanne Wegrzyn. All other photographs taken from Ancestry.